Do you have a go to favorite dinner recipe? You know, the one the make whenever someone new comes over for dinner; when you really want to wow someone? Or maybe it's what you always whip up when you want to have a nice dinner in? For us that dish is Goat Cheese & Pesto Stuffed Chicken. It's our signature dish; the Tobin Family specialty if you will. Only problem with this meal? 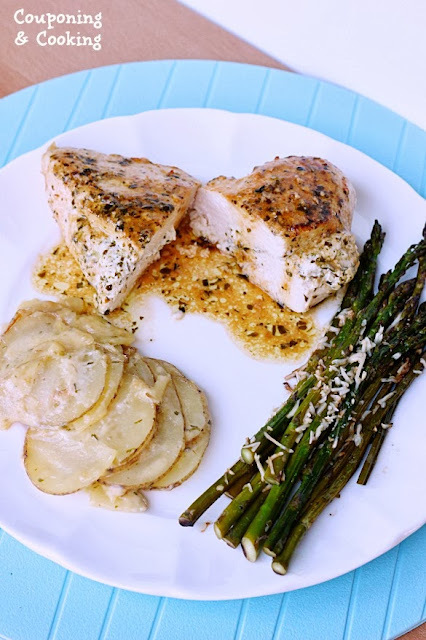 It usually requires a lot of peeling, chopping, measuring and general prep work in order to season the chicken just right, brown it perfectly and give it the exact flavor we like. Personally, I hate peeling and chopping garlic. Dicing herbs? Forget it. I don't call Justin my sou-chef for nothing. I usually beg him with sad puppy dog eyes to do the "dirty work" for me when we are making dinner. When I brought home Land O’Lakes Sauté Express® Sauté Starter in Garlic & Herbs and told Justin he could skip the chopping tonight he thought I was joking. He kept hovering around the kitchen waiting for me to ask him to jump in and peel some garlic for me or grab the salt and pepper. Neither of us could believe how little we had to do to saute our chicken perfectly. The chicken was so easy, I decided to whip up some Scalloped Skillet Potatoes with our Sauté Express® Sauté Starter too. No cutting up a stick of butter and measuring out the perfect ratio of olive oil with it to brown things, the preportioned pats only needed unwrapping. No peeling of garlic, chopping and measuring of herbs and it was so flavorful we actually never even needed to add salt or pepper to the final products, something Justin almost always does whenever I cook anything. Neither of us could get over the fresh herb taste. The potatoes were so creamy and rich, I couldn't believe that they didn't have any cheese in them. Although if you wanted to add cheese I highly doubt anyone would complain. 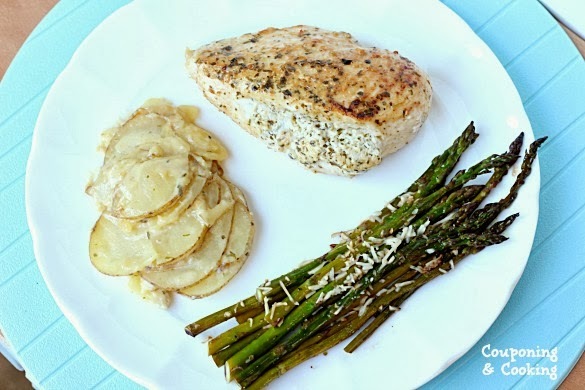 We paired them with a side of roasted asparagus for a quick and easy veggie. If you aren't a fan of goat cheese or don't have any on hand this dish can be made with any kind of soft cheese you like and we have even used cream cheese in a pinch too. 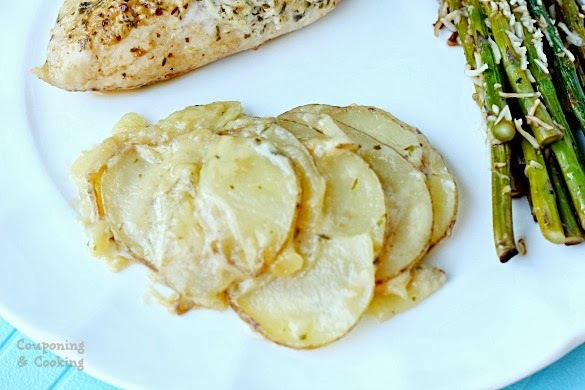 I love that the chicken and the potatoes in this dinner are both made using the same ingredients so I didn't have to go crazy at the grocery store. It was also a lot cheaper to just grab a package of this flavored butter instead of buying butter, olive oil, herbs and garlic individually. Right now you can even print a .75 cents off coupon to make it even more affordable. 1.) 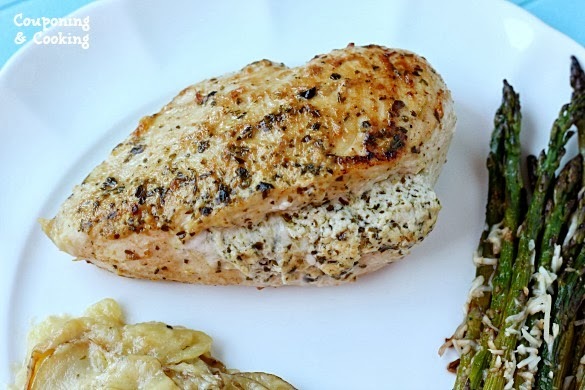 Using a filet knife, cut a pocket into each chicken breast so that you can lift up the top half to stuff it while still leaving the breast intact. 2.) Stir together goat cheese and pesto and stuff each piece of chicken with one half of the mixture. 3.) 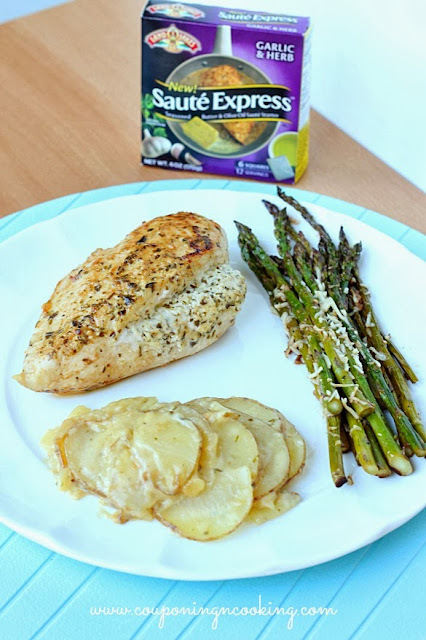 In a large oven safe saute pan melt the Sauté Express® Sauté Starter according to the directions on the package and brown the chicken on each side, about two minutes per side. 4.) Pour the chicken broth in the pan to de-glaze the bottom and then place entire pan in the oven at 375 degrees until chicken is cooked through. This will vary depending on the thickness of your chicken. After ten minutes in the oven make sure that you base the chicken with the sauce on the bottom of the pan to keep it from getting dry while it finishes cooking. 5.) Once chicken is done, let the whole pan cool/rest for five minutes and then serve topped with remaining sauce and enjoy. 1.) In a large saute pan melt the Sauté Express® Sauté Starter according to the directions on the package and cook the sliced potatoes until soft. 2.) Add the milk, cream and chicken broth stir and simmer until thickened.